You're running graphics for a live stadium event, the cameras are rolling, the screens are projecting to thousands of people in the audience, a guest speaker is approaching the podium, and someone just handed you a disk containing a file with the speaker's outline notes...and they need them on-screen ASAP! Well, if you're using Microsoft PowerPoint, you're probably up the creek without a paddle. Or, perhaps you've been provided with everything you need before hand (yeah right) and your PowerPoint presentation is following the program outline perfectly, then the speaker suddenly skips a topic and starts referencing slides that don't occur until later in your PowerPoint presentation...but where?! Despite what you may be thinking, this isn't a "trash PowerPoint" article. PowerPoint is actually a great tool and does what it was designed to do very well. However, as we all know, life is always simpler when you use the right tool for the right job. You might be thinking that the situations described above are extreme, but they are in fact completely normal (and expected) in the church arena. That's right....church. These situations are actually so common, that a whole group of products have sprung up over the last few years to accommodate them. So you're probably thinking, "Well how is this different than PowerPoint"? The difference is that while the audience is looking at the presentation screen, the operator is looking at the control interface and a heads-up display of what is currently on-screen. 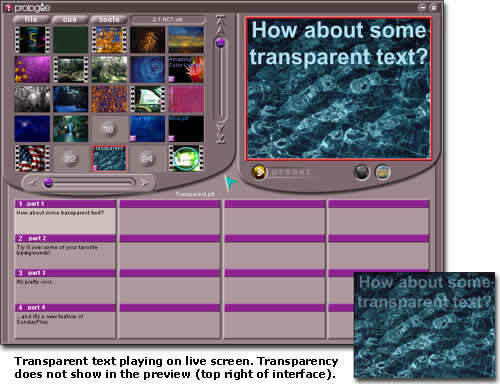 The CueList (where the order of presentation is shown) can be accessed randomly, and any Cue (slide) can be sent to the live audience screen at any time. The CueList and its Cues can be edited, moved, or deleted at any point during the presentation and the audience will be completely unaware. As a matter of fact, if you find a typo either on the text that's currently being displayed on-screen, or on the slide coming up, you can edit it right then and there without disrupting the presentation in any way. A single click will update the audience display. The entire program is "Drag-N-Drop", and all of the media that you import for each presentation is stored in media bins for easy access. So, for situations where you're being handed the speaker's notes on a disk, you can simply drag the file from the disk to the SundayPlus interface. To get it showing on the audience screen, just drag the text file up to a Cue, drag an image from the image bin and drop it on the same Cue (if a background is desired), and give that Cue a single click. Your text file will rip open and be displayed for you at the bottom of the screen where you can read it... Good for those situations where the speaker skips ahead. This process literally takes only a few seconds. The Windows version of SundayPlus was released in October of 2001 (Mac version released in April, 2002) and is now being used in thousands of churches around the country, and around the world. Obviously, not every church is as big as a stadium, but there are plenty of huge ones out there. There are also hundreds of the large-scale stadium events and satellite simulcasts using SundayPlus every year. So why are we talking about church presentation software on a website dedicated to Director? Very simple...SundayPlus was written entirely in Director 8. Once upon a time, in a galaxy far, far away...the 1970s...a little video house by the name of Flessing & Flessing started getting requests from the Billy Graham Association to come film their live stadium events, and to provide post-production services for the captured footage. As technology advanced, graphic services started becoming available to provide imagery and text for the ever-growing presentation screens. That business grew and Flessing & Flessing built a reputation for quality services in this niche market. Flessing & Flessing has since become known as Fresh Air Media. Well of course the producers and operators wanted to do more and more advanced presentations, but a problem arose of not having the right tools to get the effects they were after. Sometimes the operators would need to use as many as three or four programs during a presentation to get their message across in an interesting and engaging way. I'm sure you can image that this was not an easy task, so Fresh Air Media said to itself: "Self, why don't we build our own presentation software? ", which is just what ended up happening. 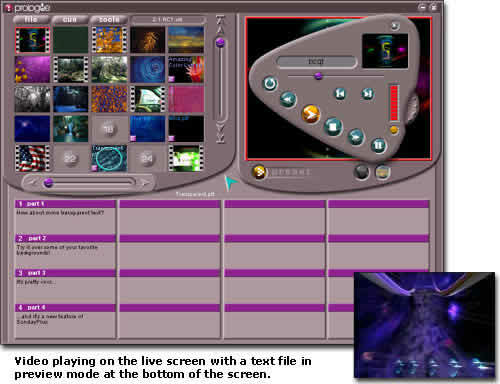 As soon as there was a working version driving the graphics at the live events, people started asking what software was being used, and could they buy a copy. Thus, Grass Roots Software (a division of Fresh Air Media) was born. Fresh Air Media currently has three divisions, affectionately called Production, Multimedia, and GRS. Production is the division that does all of the video and post-production work, and is located on the right side of the facility. There are currently 15 people running the hub-based system which runs over seven miles of cable under a raised floor. 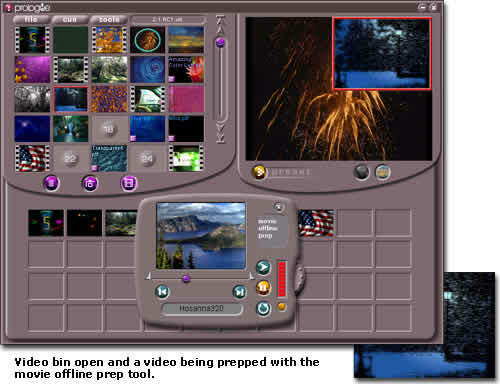 This system consists of the main-frame room, two non-linear Avid suites, 2 linear tape-based suites, a DVD authoring suite, an audio suite, and a recording suite. All of these suites are double-walled and sound proofed. When the suites are left open, there are always interesting sounds emanating down the hallways. Sometimes you hear what sounds like chipmunks singing or talking (fast-forward playback), or sometimes it's hip music and interviews aimed at teens. Whatever it is, it's usually a nice background sound, but you can always tell when they're trying to get through a tough spot because the same piece will play over and over... and over. 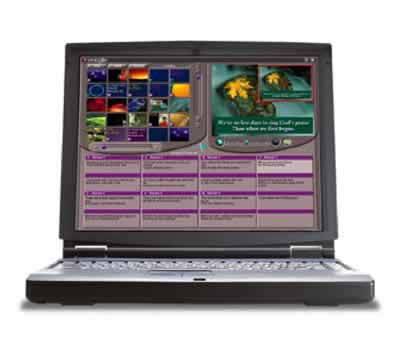 Multimedia currently has 6 people who create award-winning websites and CD-ROM's. They are located on the left side of the facility, with framed samples of previous projects ranging down the walls and awards filling up the shelves in the conference room, which is located in the center of the facility. GRS (Grass Roots Software) is also situated in the center of the facility, with 7 people who each have very unique responsibilities. One person fills each of the following positions; Interaction Designer, Senior Developer, Operations & Training, Sales & Marketing, Office Manager, Technical Support, Administrative Assistant. We all try to fill in when one or more of us are gone, but we all really like it when the tech support guy is IN, and are glad he likes his job! Director was chosen as the authoring environment for SundayPlus because of its ability to easily create highly-graphical user interfaces, its rapid development abilities, and its inherent cohesion with so many different types of media. The current version of SundayPlus (v 2.1) took 18 months to complete, due mostly to the fact that there was only one programmer building the entire project: me. Some of the extended development time was also due to the fact that we didn't start out as a software company, but grew into one instead. There were bumps and a learning curve along the way, but we knew where we were trying to go. 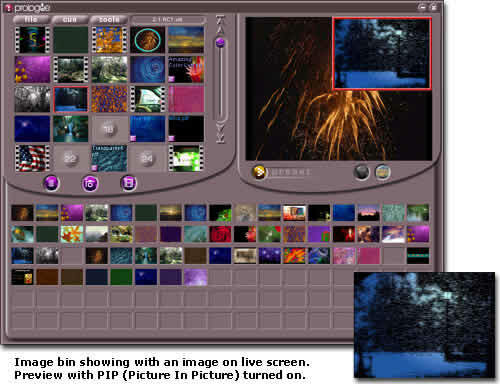 There are too many features to try and list them all here, but some of the more prominent features of SundayPlus are it's abilities to; display PowerPoint files, play QuickTime movies, QTVRs, MPEGs, AVIs, DVs, and even SWF files. 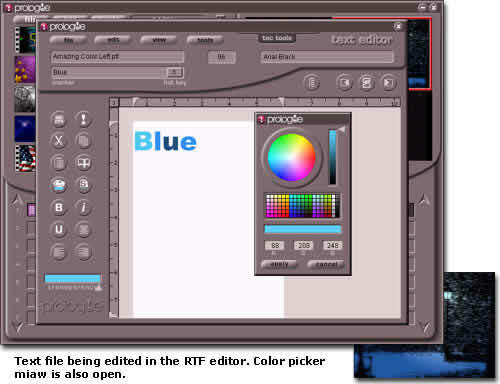 There are tons of custom transitions, a drag-n-drop interface, and even an on-board WYSIWYG Rich Text Format (RTF) editor. The editor allows the user to set character-unique formatting, transparency, margins, and drop-shadows, to name a few properties. More complete feature lists, information, and a full product tour can be found at the SundayPlus website. Many of the great features built into SundayPlus would not have been possible without the help of some very cool xtras. Here are a few of the ones we used; BuddyAPI, DM Xtreme Transitions, Drop File, FileXtra, PPViewer Xtra, PrintOMatic, TextCruncher, TreeView, and OpenDocument. Thanks to all those awesome Xtra developers out there, and keep 'em coming! There are some particular areas in the program where I know we stretched Director to its outer limits in our efforts to achieve the desired features. I even used some undocumented (and probably unsupported) features of Director that probably don't see the light of day too much. One such feature affects what we call the "Live", or "Audience" screen. 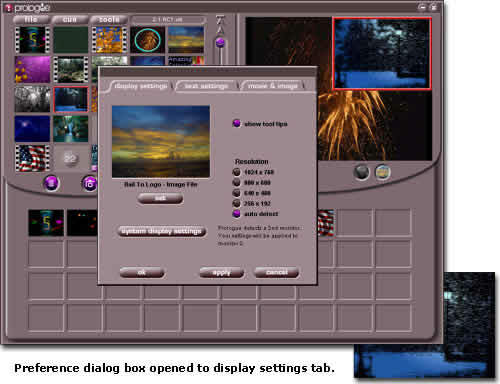 There are so many different computers out there using so many configurations, that we needed that screen (implemented as a Movie In a Window or MIAW) to be sizeable, and still show everything in the right place with the right proportions. After much experimentation, we ended up using the drawRect command to get this functionality. The screen size options are 1024x768, 800x600, 640x480, and 256x192. The smallest size is useful for previewing a presentation in situations where you only have one monitor available, or you want to run the presentation on the primary monitor to prevent the audience from seeing your test run. SundayPlus also has an auto-detect function that will find the second monitor for the user. It uses the desktopRectList, does some very tricky math, then automatically places the screen in the center of monitor two. In order to get everything to be drag-n-drop, we used tons of sprites, and a great little Xtra called Drop File, which allows files to be dragged from Windows Explorer (any folder or the desktop) and dropped onto the interface. Once the Xtra delivers a list of files that were dropped, it's just a matter of sorting through them, importing them, and discarding any that were not valid file types for the program. When you start pushing the limits of what Director can do, you are immediately forced to become extremely creative in finding ways to give your program the required features. The RTF editor was by far the hardest and most time-consuming piece of the project. As we all know, Director was never really intended for such heavy concentration on its RTF abilities (or lack thereof). Parsing the raw RTF, interacting with the user formatting tools, then applying the settings to an RTF text member was excruciatingly awful. I actually had to read the Microsoft Rich Text Format Specification manual. That had to have been the worst 160 pages of my life! Since the editor allows the user to control non-standard text file settings such as type (song or text), transparency, custom drop shadows, and much more, a proprietary file type was needed. It went through several evolutions before it ended up being a multi-dimensional property list. Not only were these things challenging in and of themselves, but when you start pushing the limits you get more and more layers of compounded complexity. For example, now that the user can control margins (the height, width, and position of an RTF text member), you have to remember those dimensions and get them to play back correctly in the MIAW, which is being zoomed using drawRect. Say they have chosen to show the text only in a small box in the upper right-hand corner of the screen, a small ways down from the top. Add to that the fact that since you're using drawRect, normal RTF text looks horrible so it needs to be converted using imaging Lingo. I won't even go into all of the headaches this caused, but you're probably starting to get the idea. Let me just put it this way, I use a composition notebook to write all of my ideas, computations, and drawings in during development, and use highlighters to help me sort out or keep track of difficult areas. My sections on text and RTF glare when you open it to those pages! I also made heavy use of imaging Lingo in rendering items as they get dropped in the CueList. There are image thumbnails, video thumbnails with cogs down the sides, song indicators, text indicators, PowerPoint indicators, and nested CueList indicators, which all need to be composited in varying ways as the user drags items to each Cue. I'd have to say that the biggest technical challenges were due to the imagination of our Interaction Designer. He's the one who originally wanted to create this presentation system, and is himself an experienced and creative operator. He forced me to push Director, and my own knowledge of Director, to the farthest reaches, which in the end I can say I'm happy for. Some days it felt like I was trying to stuff an elephant into a rubber glove, but it all came together eventually. When you are the creator of something, you always have a unique perspective in that you know where all the perceived flaws are, and you bite your nails wondering if your creation will be good enough. The most wonderful thing about getting to the end of this project was seeing our "baby" emerge into the real world and watch people respond to it. You of course can't please everyone, but SundayPlus has been acknowledged as a top contender in its class and has built a following of loyal customers. It has a very active users group where about 300 customers come and interact with us, and each other. It's pretty great, and it makes the development process seem worth the effort. When I'm not knee-deep in product development, I spend time maintaining the SundayPlus website, interact with the SundayPlus Users Group, and do lots of R&D for future versions of SundayPlus. This includes searching for more cool Xtras, interaction design, usability design, and product or feature prototyping. I've been working in the multimedia authoring & programming field specializing in Director and Lingo for 5 years. During that time, I have done lots of other multimedia projects for websites and CD's. One of my simpler Director projects can be found on CNet / Download.com. I try to do my part in keeping Director alive and well by volunteering my time to college and high school students. I've been a guest speaker at the college where I graduated (Sierra College - Rocklin CA), and done lots of Job-Shadows where students come and spend the day with me at work. I even had five high school students (all boys) at the same time once when it was only supposed to be one. Gee, that was fun. I am a member of the Sierra Macromedia User Group based in Auburn, where I have also been a guest speaker. More of my projects can be found by browsing my personal website. I love interacting with other Director users, so feel free to email me with your questions or comments. ¬†Susi Sloan is the Senior Developer for Fresh Air Media/Grass Roots Software in Auburn, California. 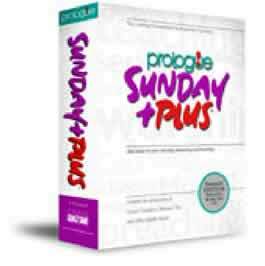 She was the sole programmer for their SundayPlus presentation program. Her personal web site is www.s-media.cc.